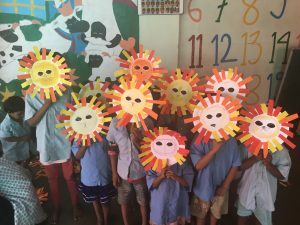 Dear friends, welcome to our second blog post from India, we wanted to say an especial thank you for all the support and kindness from all you folk back home, as well as thanking you for taking the time to read our latest blog post. It is terribly long because we have been so busy recently, but hopefully you will make it to the end! Once again thank you and God bless you. “Auntie, Auntie!” has become a phrase that will always stick in my mind as part of my experience at school here in Kolkata. We have now started to teach English to the children at GNCEM and the number of times I hear this in a morning has definitely increased! Each morning, when it is time for us to teach the children, the class of about 60-70 splits into three different age groups-Cameron takes the youngest, Emily the oldest and I take the middle group. I think it would be fair to say that we have found our first few lessons to be quite challenging as not only are the children not used to a formal school structure, but all three groups have to be taught in the same small room with each of us teaching different activities. As you can imagine, it is very noisy and chaotic! However, we are excited to have been given more responsibility and are looking forward to getting to grips with teaching in the coming weeks and months. We have started working at a new project once a week called “Daisy Project”. After our first visit we have completely fallen in love it and the people we have met there and we came out of that place feeling so full of hope and love. We met Rebekah, the wonderful lady who runs this project, and she told us the story of her work in Kolkata over the past 10 years. 3 years ago, God called her to set up Daisy project and now she has a beautiful home with 14 children that she has taken off of the streets and made her own. 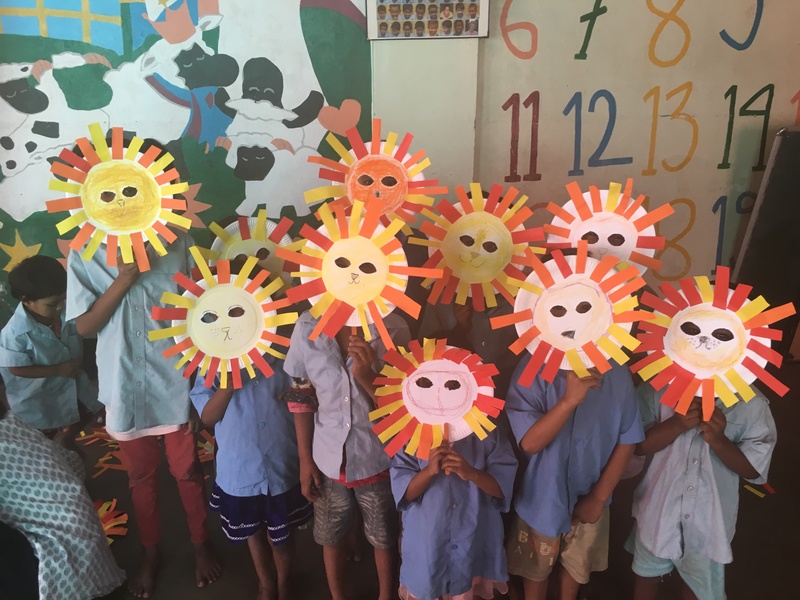 Part of “Daisy Project” is education support for children who live in the slums, they come to the centre everyday where they are fed and given support with their school work which enables them to go to school and get a good education. This is such incredible work because it keeps the children off of the streets during the day, they are given a routine and help with school work so that they can keep up with their studies and their mothers do not have to worry about them being left alone on the streets all day. 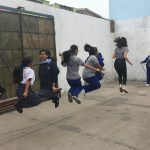 We have started to teach this group of children English which should help them with their school work as many of their lessons are taught in English. The rest of “Daisy Project” is a home where Rebekah and her husband live with the 14 children from the streets and their two biological children. The love we saw that Rebekah has for these children and the way their lives have each been transformed was so inspiring and one of the most beautiful things I’ve ever witnessed. We also joined in with their family worship night. They played some worship songs and the children worship so passionately; before we knew it, the children had taken our hands and were praying for us. It was such a moving experience and we feel so privileged to be welcomed into their home and look forward to our visit each week! Due to some additional time, freed up by the school (GNCEM) being closed over festival time, we found ourselves very quickly becoming bored without work to busy ourselves with. Naturally a first point of call for us was the opportunity to volunteer with the Missionaries of Charity, the Catholic religious order founded by Mother Teresa in 1950. Within the city there are seven different houses run by the Missionaries of Charity, which each offers a different form of charitable service to people, for example one house called ‘Prem Dan’ meaning ‘A Gift of Love’ serves the elderly, dying and destitute, whilst another called ‘Shishu Bhavan’ is a home for infants. We all found our experiences very different, not least because we did not all go to the same houses. Emily and Erin volunteered at Shishu Bhavan, which is a house only permitting lady volunteers. Whilst I, Cameron, volunteered at Prem Dan in the mornings and Khalighat, the first house started by Mother Teresa which serves the dying and destitute, in the afternoons. 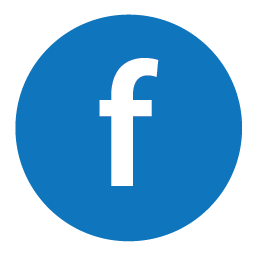 We have each produced a different account of our experience volunteering with the Missionaries of Charity. Emily: I went and volunteered at Shishu Bhavan working with children that have physical disabilities. You don’t get any briefing or instruction on what to do so I tried to copy some of the other volunteers to get stuck in! After putting on my apron (which I later realised was much needed because of the amount of urine you get all over you during the course of the day!) the day began. Firstly, you play with the kids and go and spend time with them. 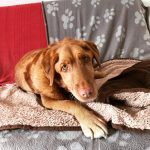 Some of them can play but lots of them can’t speak or move and so you go and give them a hug or sing to them or stroke their arm etc. Then comes snack time! 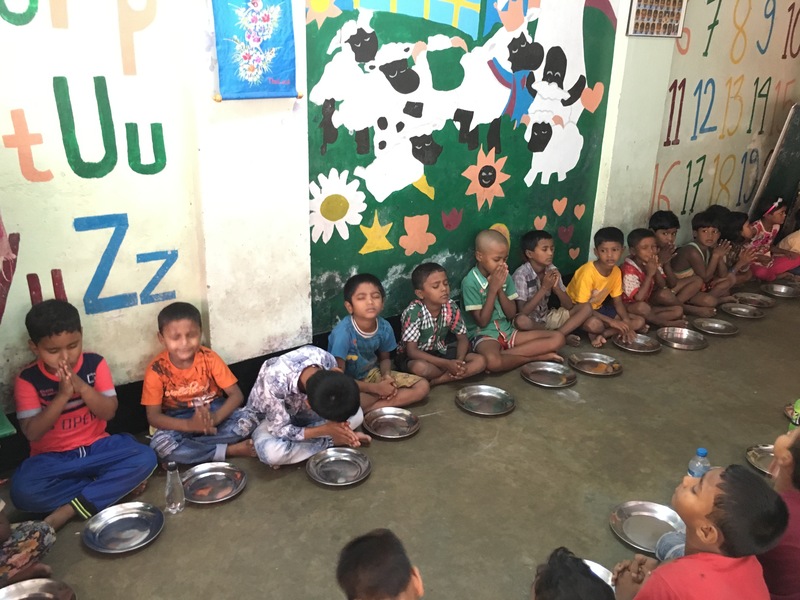 Lots of the children find it very difficult to eat and so hand feeding them is quite a long and difficult job, but it is very rewarding when a spoon successfully goes in their mouth and the food doesn’t end up running down their face and the back of their neck! Then comes more play time and then is lunch, followed by putting the children in their beds for nap time. That is the morning shift over, then home for lunch and back in the afternoon for more play and feeding. One of the most rewarding moments for me was when I went and sat with a girl who couldn’t speak or walk but I took her hands and started to sing nursery rhyme songs and she just kept smiling which was so amazing to see. Furthermore, there was a girl that for the time I had been there all of the first day and the second morning, seemed to spend all the time on her own. To me she looked very scary and I assumed that being alone was how she liked to be and I wasn’t going to be the one to go over and annoy her! Someone told me on the second afternoon that actually this girl is blind but loves being with people. A little nervous, I braved going over and as soon as I touched her she reached out, gave me the biggest hug and wouldn’t let go! I walked around with her for ages and gave her lots of hugs and so was challenged to be accepting of everyone and to make an effort with everyone, not just the cute smiley kids it’s easy to spend time with. The time I spent volunteering at Shishu Bhavan has definitely been one of the biggest challenges for me so far. It was heart breaking to see how disabled some of the children were, knowing that all they do each day is lie on the floor staring at the ceiling. I didn’t know what I was doing and I didn’t really know how best to help the kids and I felt like anything I was doing was so insignificant and couldn’t make a real difference to the children’s lives when some of them have so many challenges. But I learnt so much from my time there about being so grateful for all that I have been given and challenged to live my life to the full! Also, I think this famous quote by mother Teresa sums it up: ‘Do small things with great love’. I couldn’t change the quality of those children’s lives but by giving them a hug, or singing them a song I could put a smile on their face and sometimes that is all you can do and that is enough. 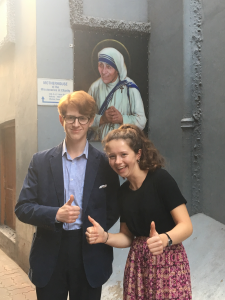 Erin: Although, at first, I was apprehensive at the idea of volunteering at Mother Theresa’s, I have really enjoyed the mornings and afternoons we have worked there so far and I plan to do more afternoons in the coming weeks. 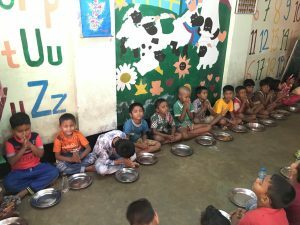 I chose to volunteer at Shishu Bhavan and more specifically with the toddlers there which involves a lot of playing and also feeding sessions at various points. Feeding, in particular, can be more difficult than I first anticipated, especially when a child decides they no longer want to eat-prepare to get spattered with food! Another unexpected challenge has been folding laundry as apparently there are numerous different and complicated ways to fold very similar items (I will never complain about folding laundry at home again)! Despite these challenges and additional ones with the language barrier between myself and the Macees (Indian workers), it’s been such a wonderful experience and so rewarding when I see that a child is crying and am able to cause them to smile through a few tummy tickles or a nice cuddle! I couldn’t ask for work that is a more perfect fit for me than this! Cameron: I was very excited to begin volunteering with the Missionaries of Charity, although slightly worried about how to actually get to and from the locations. I volunteered at a house called Khalighat in the afternoon, around 30-40 minutes drive by bus, quite an experience in itself, thankfully one of the volunteers here at the guesthouse was able to give me directions on paper and by using them I was sure not to get lost. 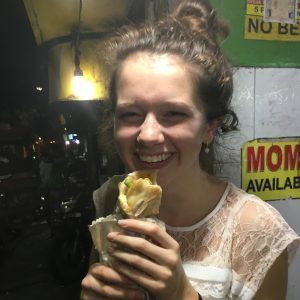 I chose to volunteer at Prem Dan and Khalighat because they are both similar houses in terms of serving the elderly, dying and destitute, which is unlike anything I have ever done before, although very challenging I am very glad to have volunteered and intend to continue doing so regularly. At Prem Dan the work is very physical in the mornings, the day begins with the volunteers going up to the roof top and hanging out all the wet clothes that have been washed after the patients wore them the previous day, this was a very good opportunity to meet some of the other volunteers, many of whom I now count as friends. Following this we all then went downstairs, carried large buckets of water and after having emptied them on the floor used straw brushes to clean the floors, a satisfying but tiring activity. We then helped with some general tasks, we helped make the beds, as well as one day cleaning the metal tracery on the window bars and pealing different fruits for the patients to enjoy as a snack. Thankfully we also had a nice sit down over a tea break, before promptly returning to work by handing out cups of water, fetching large vats of food for lunch or by handing out the snacks prepared earlier. After this we then helped hand out lunch, I and many other volunteers had to help to feed some of the older gentlemen who had physical injuries or mental deficiencies. Prem Dan was certainly rewarding but equally tiring and I look forward to going back. Khalighat is very different in the afternoons, I have heard from other volunteers that the mornings sound very much the same as Prem Dan however. The afternoon is much more gentle, as I helped to give out medication, to pass out water and meals and also to sit, speak and play games with the residents, such as a set of puzzles. In many ways the afternoon was much more difficult, with more time to speak to the patients and less tasks to do it really sinks in that many of them will never leave and that many must have had such difficult lives outside. • Finding our roles within the school environment and having the structure to be able to plan. • For the love and goodness we have seen at the Daisy project, for the children there and the adults running it. • All the children we teach are able to learn and benefit from the lessons. • That we will be able to overcome and language barriers, especially those with the children. • That we will be able to learn and remember useful phrases in Bengali. The kids at school were extremely proud of their Daniel and the lions den masks! Egg rolls have become a staple in Emily’s diet! 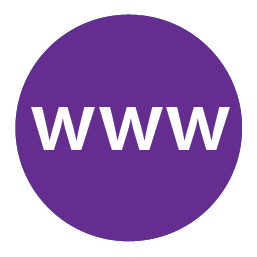 https://www.actionteamblogs.org/wp-content/uploads/2018/11/IMG_0264.jpg 3024 4032 Kolkata https://www.actionteamblogs.org/wp-content/uploads/2015/09/BMS-logo-WHITE-199x300.png Kolkata2018-11-04 16:04:222018-11-06 14:19:05"A smile generates a smile"
Egg rolls from Frankies?! They’re so good if you haven’t tried them yet! Sounds like you’re having a challenging but great time, it is so exciting to hear about all of the things you are doing. We’re praying for you here at SBC! Looking forward to hearing more stories from you soon!! Big big challenges that you are all facing up to brilliantly. Massive respect. Early days and so much achieved. Life is like in Kolkata. Will continue to pray and we look forward to the next blog. Thanks guys for giving everyone such a great insight into everything that you are getting up to. We’ll continue to pray for you as you get to grips with your enormous classes! And I love the lions masks! Hi guys! 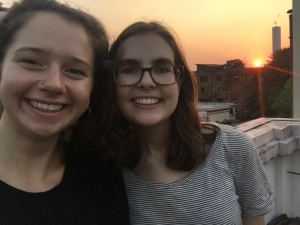 I was on an action team in Kolkata in 2016-17 – It’s so lovely to hear about your time so far! I hope it’s all going well, I’m praying for you guys! Enjoy it! Kolkata really is an amazing city, it’s got its challenges, but it still has so much life! England will seem so boring by the time you get home! Also enjoy the egg rolls! I still miss those things nearly 2 years on! Send my love to Anu and the lovely guesthouse peeps! Lovely to see some photos! I have copied the one of you and also the work with children on to Chestnut Street School so hopefully they can see what you are doing!